Oldcastle Precast products helped speed the rebuilding of Interstate 10’s Tex Wash Bridge in California. The California Department of Transportation (Caltrans) set an ambitious two-month timeline to rebuild Interstate 10’s Tex Wash Bridge after the eastbound bridge failed during a major storm in July 2015. Fast-moving flood waters shifted the dirt that held its foundation in place. Interstate 10 was shut down between Route 86 and the Arizona border, four miles west of Desert Center, Calif., after the 30- by 50-foot section of the bridge collapsed. 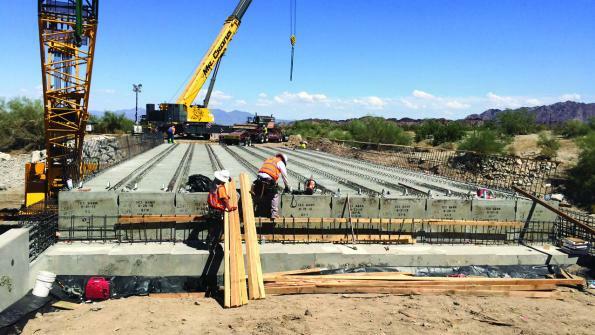 Since the bridge is a critical piece of infrastructure connecting drivers traveling between Arizona and California, Caltrans’ goal was to speed up the replacement bridge design and construction. Caltrans selected Accelerated Bridge Construction (ABC) methods to fast-track the eastbound I-10 Tex Wash Bridge reconstruction process. ABC entails prefabricating as many bridge components as possible to minimize road closures and traffic disruptions, promote traffic and worker safety, and improve the overall quality and durability of the bridges. Caltrans designed the bridge superstructure as a modular precast concrete system using precast concrete bridge superstructure elements. This made it possible to install the prefabricated bridge units over two weekends. For the bridge replacement, Granite Construction contracted Oldcastle Precast to manufacture two precast concrete bridge abutments, cast in four segments, measuring 6-feet by 6-feet by 20-feet long, four precast concrete wing walls measuring 18.5-feet by 1-foot by 9-feet tall and ten prestressed box girders measuring 4-feet by 3.5-feet by 105-feet long at the precast firm’s Perris, Calif. plant. As a team, Caltrans, Granite Construction, and Oldcastle Precast worked around the clock to ensure the emergency bridge replacement stayed on schedule. The result: Caltrans rebuilt the bridge under budget and earlier than their deadline. The rebuilt eastbound Tex Wash Bridge on Interstate 10 fully reopened to traffic just over two months after beginning construction. The $5 million, Interstate 10 Emergency Bridge Replacement-Tex Wash Bridge project required the complete demolition of the existing eastbound bridge, replacement of rock slope protection in the channel below, and rebuilding the bridge in an accelerated fashion. Oldcastle Precast provides building products and services for North American Infrastructure projects. The firm offers engineered product solutions nationwide. Click here to learn more about Oldcastle Precast.